Founded in 1993, Uptown Billiards sought to combine high quality pool tables and a great beer selection from its beginning. Back then micro brews were just beginning to boom, and draft selections weren’t as common as they are today. The original line-up featured Anchor Steam and Sierra Nevada as the premium micro brews and several German imports. While kegs were hard to come by, with a little research we supplemented our beer selection with numerous bottles. At one point we had one hundred and ninety different bottled beers crammed in our coolers. Around the turn of the century, when we were all surviving the Y2K Bug, Uptown expanded our adult beverage selection to include a full bar and brought our same palette and tastes to a whole new set of spirits. Our emphasis has been and continues to be whiskey. With over sixty Single Malt Scotches, two dozen Irish Whiskeys and dozens of American whiskeys and bourbons we have the best selection of whiskey in town and continue to seek out limited edition and rare whiskeys. We were the first bar in Flagstaff to carry John Powers Irish whiskey, the number one selling whiskey in Ireland, and we sell more Powers than any bar in the state of Arizona – a record our loyal and happy customers make certain that we maintain. We also find unusual spirits and keep a hearty selection of brandies, Demerara rums, and herbal liqueurs such as Chartreuse, Absinthe, and Agwa. In fact, on any given day you’ll find more folks sipping on beers and whiskeys than knocking around our Olhausen pool tables. In the tradition of a pub or public house, Uptown hosts a variety of events and activities to promote conversation and camaraderie. We feature monthly poetry readings, book clubs, and literary events such as the famous (or infamous) Hunter S. Thompson Day, Charles Bukowski Day, and Kerouac & Beat Literature week. We’ve had the good fortune of having such writers as Robert Bly, Greg Pape, Tim Seibles, William Kittredge, Annick Smith and numerous others come through our doors. Our readings have also featured prominent local writers such as Jill Divine, Nicole Walker, Marty Sommerness, and Jim Simmerman. The body of course fuels the mind, and beyond our readings we also facilitate various drinking and exercising activities. Our Rum Runners Club (“Drinkers with a Running Problem”) can be found gathering after and before Monday evening runs in the summer. 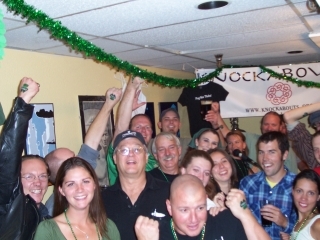 Our Tug O War team, while pulling for the local food bank, has won several championships at the annual Celtic Festival. Over the years we’ve had a hoot hosting a slew of other sundry events. In the backroom Scotch tastings frequently keep the seats full. From time to time we feature artists such as Jeremy Singer, John DeGraff, and Will Viktora for the monthly First Friday Art Walk. Our annual St. Patrick’s Day party always draws a crowd, as does the Half Way to St. Pat’s Party for those who can’t wait six more months. Our Great Guinness Toast/St. Practice Day in February also warms the bellies of those who can’t wait one month more for the big day. You won’t find any top 40 commercial, corporate crap music vibrating in your ear canals while hanging out at Uptown. We own our old and sometimes temperamental jukebox, so we can add travelling and touring musicians, local singer and songwriters, and an assortment of alternative and independent artists. Numerous singers and song writers have performed their original work live as well. From Seattle, musicians Camille Bloom and Carrie Clark can be found making us a stop on their tours. Po Boy Soul has graced our stage. Drink inspiring bands such as Whiskey Rodeo and the Knockabouts have also encouraged many rowdy nights. Nolan McKelvey, Ryan Heinsius, Matt Hall, Dean Bonzani, and Joe Sorren are all musicians to have crooned, picked or beat on something in front of a packed crowd. In July of 2004 current owners James and Alyson Jay purchased Uptown Billiards. James was one of the first bouncers to work at the bar, starting a week after the place opened, and working as a janitor, a bartender and anything else to supplement his income while he attended graduate school in Northern Arizona University’s English Department. Eventually he left town to work throughout the Northwest, but returned to Flagstaff in 2000 to work as a bartender and seasonally for the U.S. Forest Service on the Mormon Lake Engine crew. When not bartending, James is a writer whose first collection of poems, The Undercards, came out in 2003 and won the Sashimi Award from Gorsky Press in Los Angeles. His most recent collection, The Journeymen, came out in 2010. Alyson Jay is a musician who came from Youngstown, Ohio to Arizona to work on the South Rim of the Grand Canyon in the spring of 2000. Her travels brought her through Flagstaff, California, and Washington until eventually she returned to Flagstaff in the 2003. She is a touring musician and continues to write and produce music. Her first CD, Bones in the Backyard, was released by Elephant Red Records of Sausalito, California in 2006. Her latest collection Upside Down came out in the winter of 2009. Koshari Television’s Tyrus Coursey has described Alyson as the “siren of the mountain,” FlagLive has awarded her the Editor’s Choice Selection for best babe in Flagstaff, and PBS President David Lowe has described her as “the most vibrant voice of her generation.” James and Alyson have three dogs and a young son named Wilson.